When foot meets ball on Saturday in Ohio Stadium, almost everyone expects No. 10 Ohio State to come out and play angrily after what happened in its last game. That includes Nebraska, which visits the Horseshoe (noon ET, FOX) as Ohio State's first opponent since its 49-20 loss at Purdue on Oct. 20. "I foresee their team coming out and playing with their hair on fire at the beginning," Nebraska coach Scott Frost said. "We need to able to withstand that initial surge and play well at the beginning." Ohio State coaches spent the bye week analyzing what went wrong in West Lafayette and worked diligently in practice on fixing the issues. The weaknesses are glaringly obvious -- red zone inefficiency, the lack of a consistent running game on offense, penalties, and giving up big plays on defense. The areas of emphasis, coach Urban Meyer said, are "No. 1, making sure we structurally have the right play call. No. 2, get more movement, and No. 3 is running through tackles." The Buckeyes (7-1, 4-1 Big Ten) realize that another loss would severely damage any hopes to reach the College Football Playoff and give hated rival Michigan a leg up in the Big Ten East Division. "We understand November and where we're at," Meyer said. "We understand what's at stake. We understand our shortcomings. "Urgency is probably the key word around here. It's hard to say I've ever seen a staff work as hard as we've worked to try to fix the issues, and the same with our players." If Meyer was frustrated after the first loss of the season, he's keeping his emotions in check -- at least in public. At his weekly news conference, he addressed rumors about his future by saying he'll be back at Ohio State next season. "Clear the bad taste from your mouth and move forward," Meyer said. 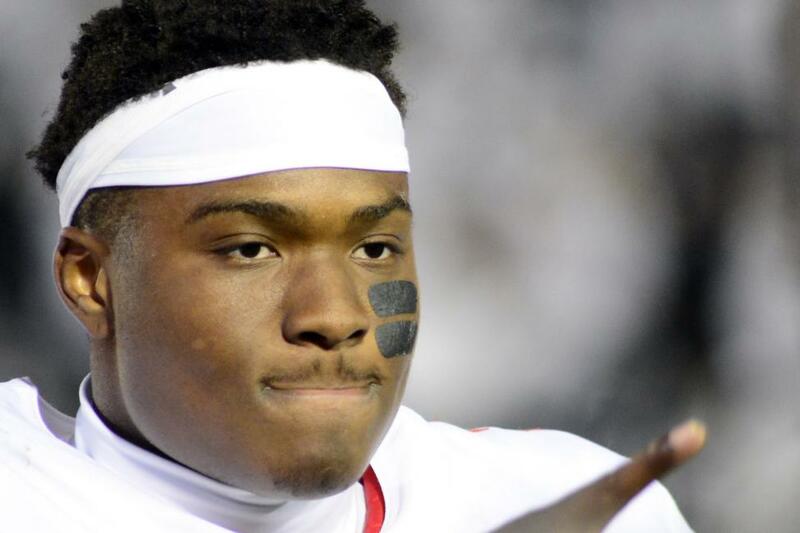 Ohio State managed to handle their first seven opponents by relying on the strong and accurate arm of quarterback Dwayne Haskins, who is having one of the best seasons as a passer in Ohio State history. The third-year sophomore has completed 71.1 percent of his throws for 30 touchdowns. But Haskins is not a mobile quarterback and that allows defenses to gear up to stop running backs J.K. Dobbins and Mike Weber. Each of the two backs has rushed for 100 yards in a game only once this season. The Buckeyes also have experienced difficulty in short-yardage situations and inside the opponents' 20-yard line. In the loss to Purdue, Ohio State scored only six points on five red-zone opportunities. "We're not playing well," Meyer said. "And, you know, I'm one of those guys that I want to help fix the issue, like all coaches do." Ohio State should have an opportunity to get back on track against Nebraska (2-6, 1-4), which ranks No. 103 in the country in scoring defense and No. 102 of 129 FBS teams in scoring defense. The Buckeyes have routed the Cornhuskers the previous two seasons by a combined score of 118-17. "I know they will be prepared in the first quarter to play their best football of the season," Nebraska linebacker Mohamed Barry said of Ohio State, according to the Omaha World-Herald. "How you handle that is your alignment, assignments, your execution, have to withstand the fire they're going to bring in the first quarter. "If you can do that, then Purdue's going to seep back into their minds. The doubt's going to seep back into their minds. That first quarter is big for us." Nebraska struggled to an 0-6 start under new coach Scott Frost but has won its last two games, whipping Minnesota and Bethune-Cookman. "We're riding a wave, and we're trying to keep it going, trying to keep it trending in the right direction," Nebraska cornerback Dicaprio Bootle said. "Everybody's just fired up for this game." Ohio State's defense will have to deal with freshman quarterback Adrian Martinez after struggling against Purdue's David Blough. Martinez has already set a school freshman record with 1,656 passing yards. The prized recruit visited Ohio State last season and became friends with Haskins before choosing Nebraska. "Elite guy. He's a dual guy that can run and pass," Meyer said. "He's doing a very good job."